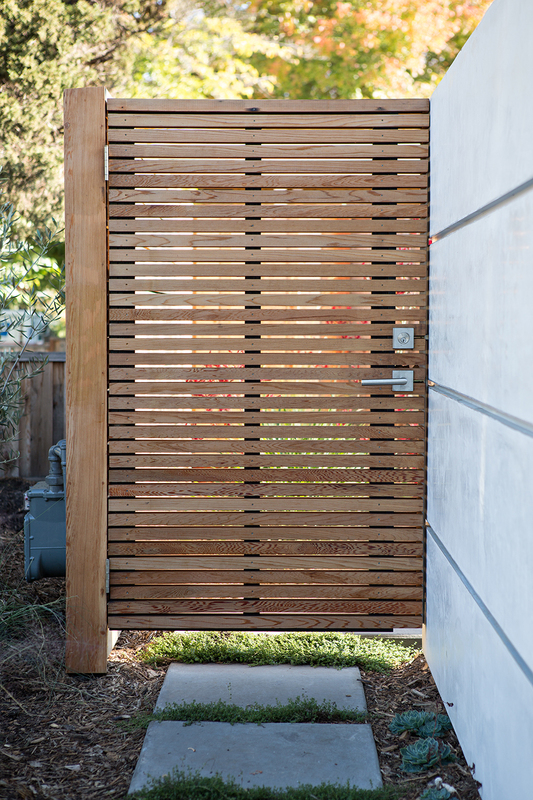 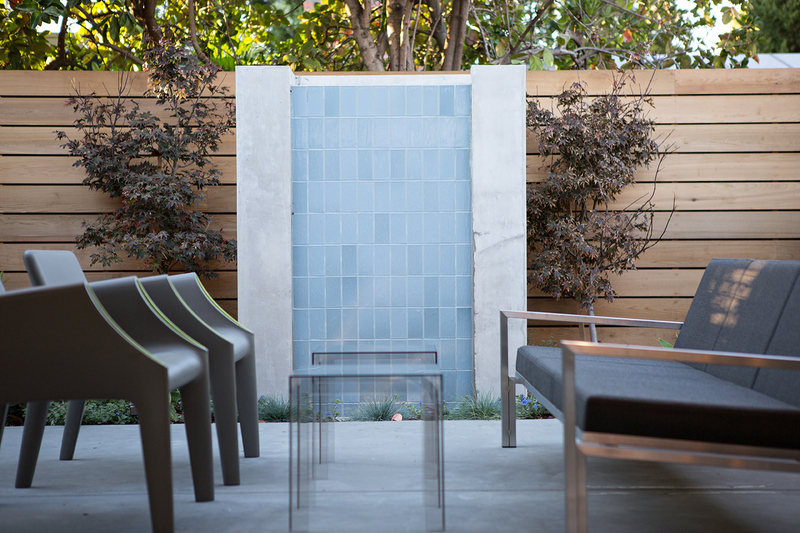 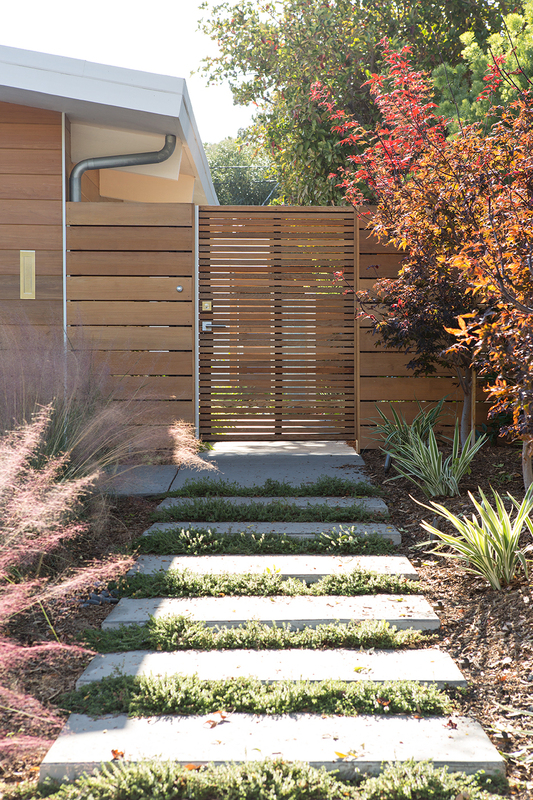 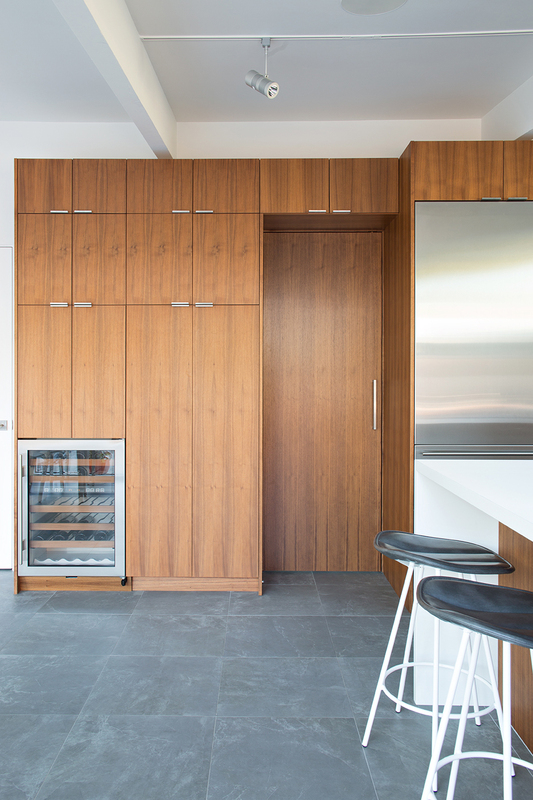 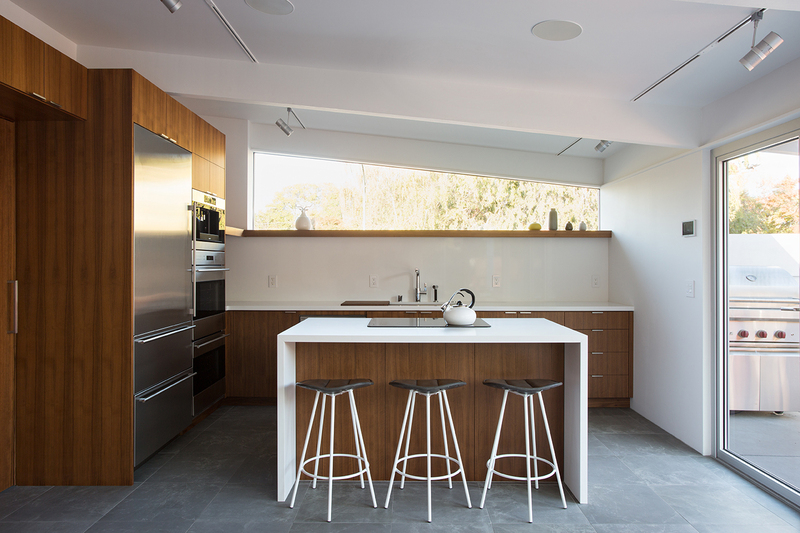 San Francisco based Klopf Architecture, recently shared some of their exemplary residential work with us. 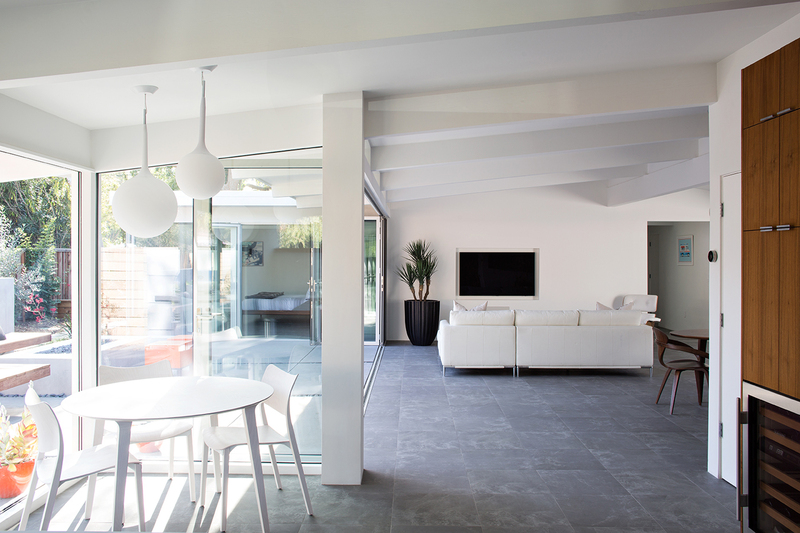 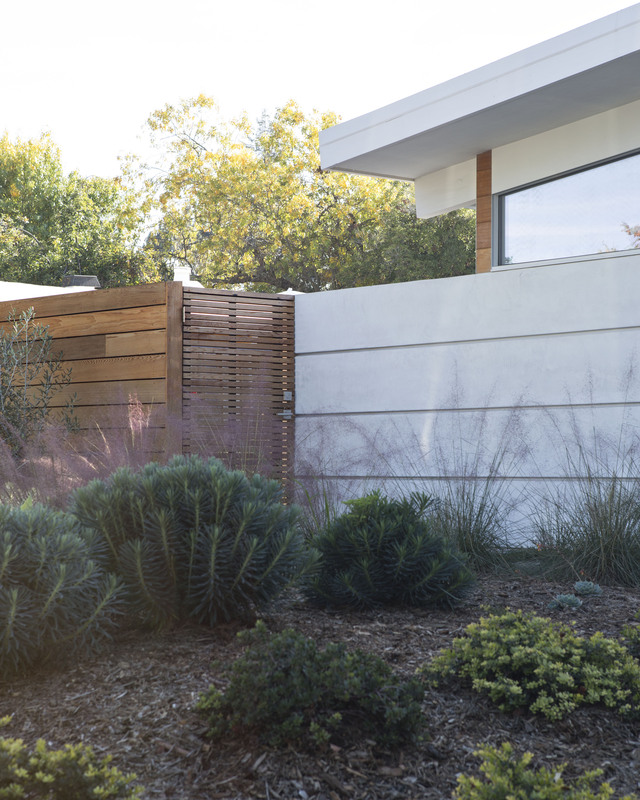 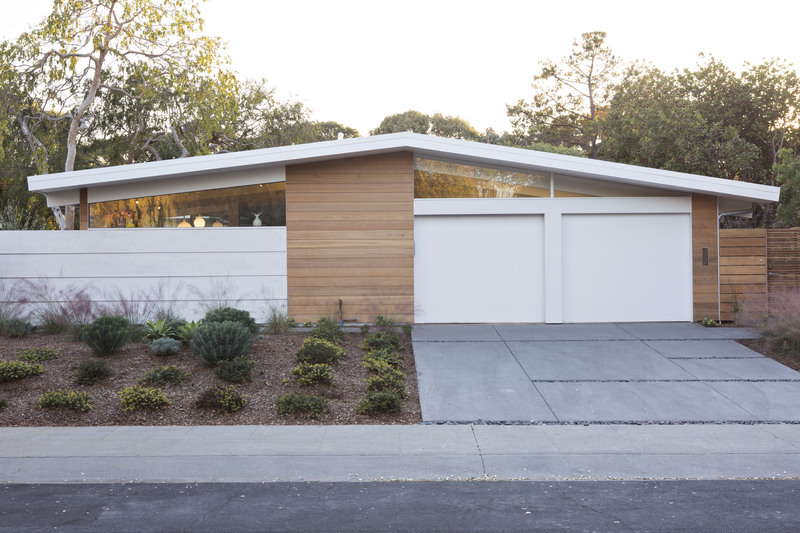 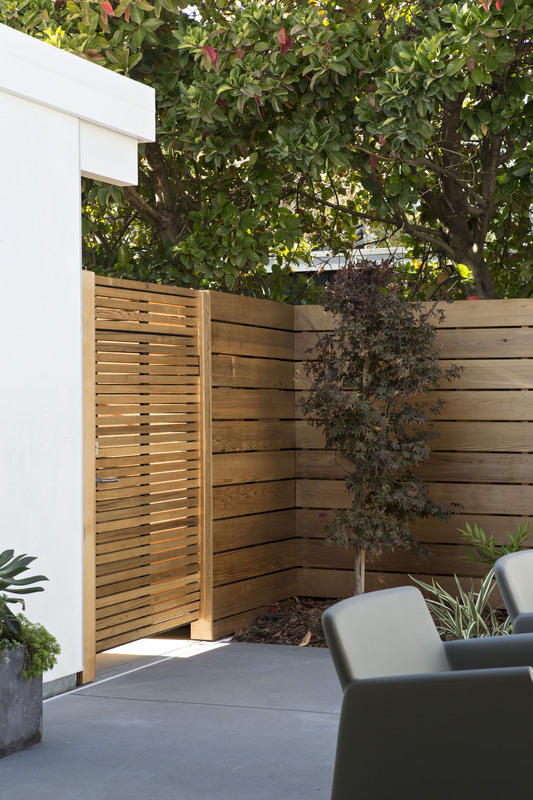 This particular project is an remodel of a classic Eichler Home in Palo Alto, California, and features a large open plan that is well lit and well ventilated with a peculiar indoor / outdoor flow. 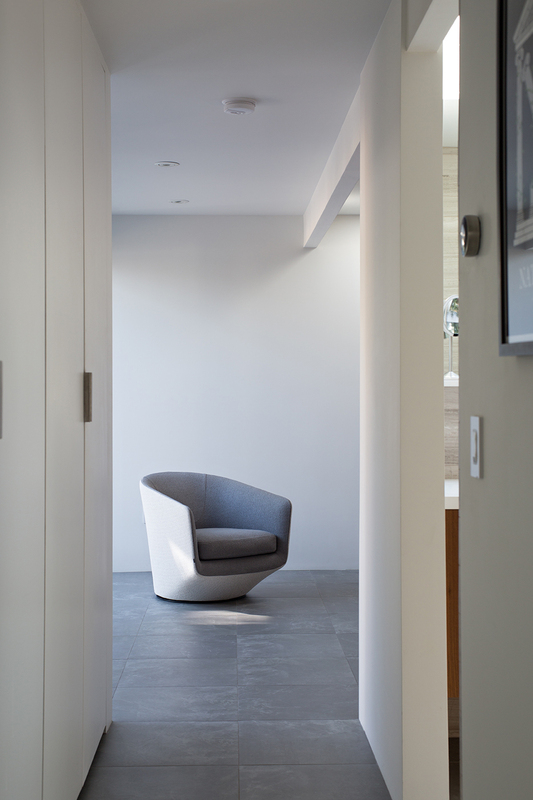 The 3 bedroom, 2.5 bathroom, single-family home, covers about 159 sqm, offering a blend of classic elements and a modernist aesthetic. 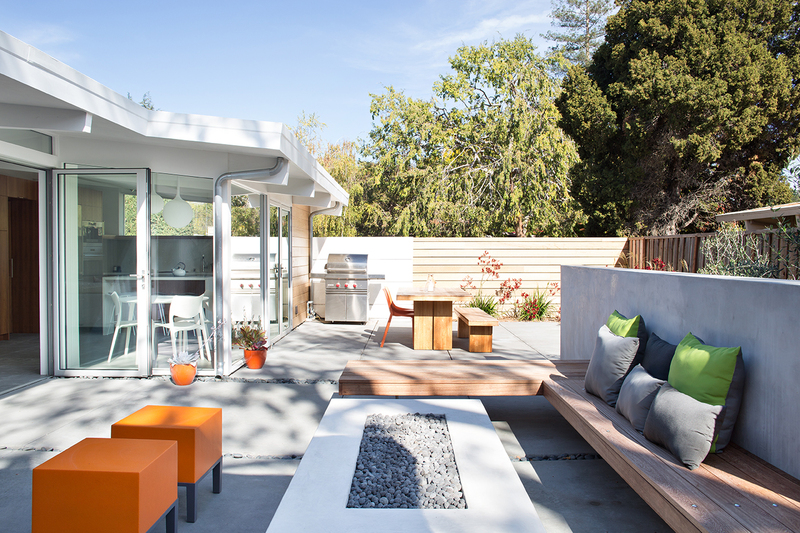 Its a unique mix that is functional and has what I believe American’s call, ‘curb appeal’. 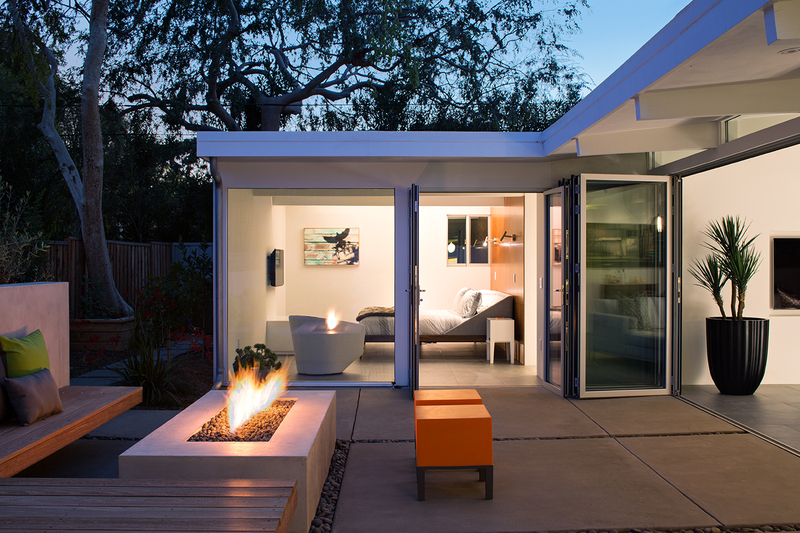 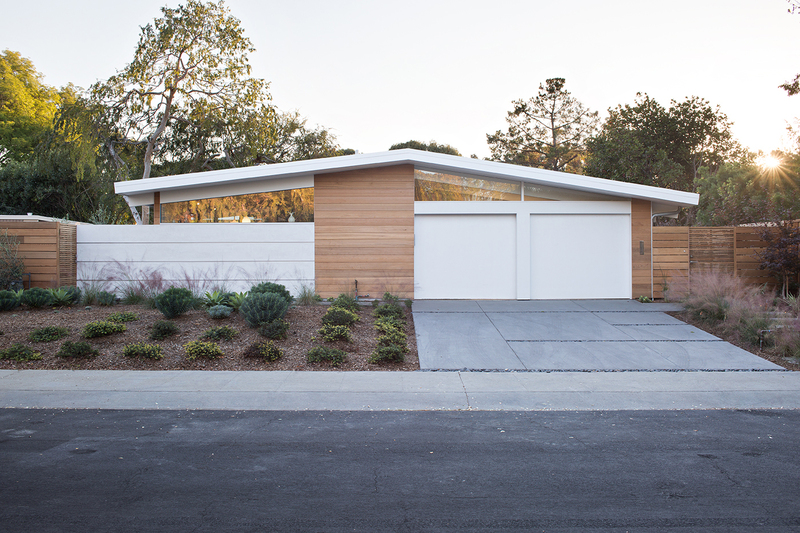 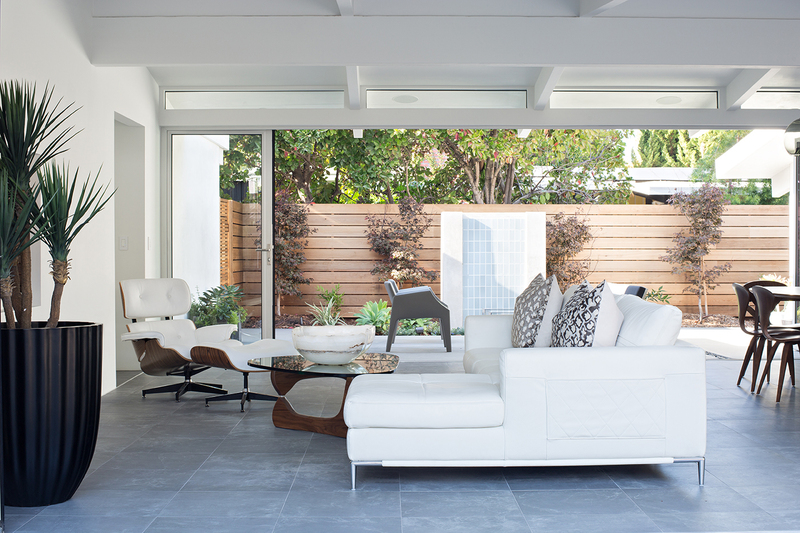 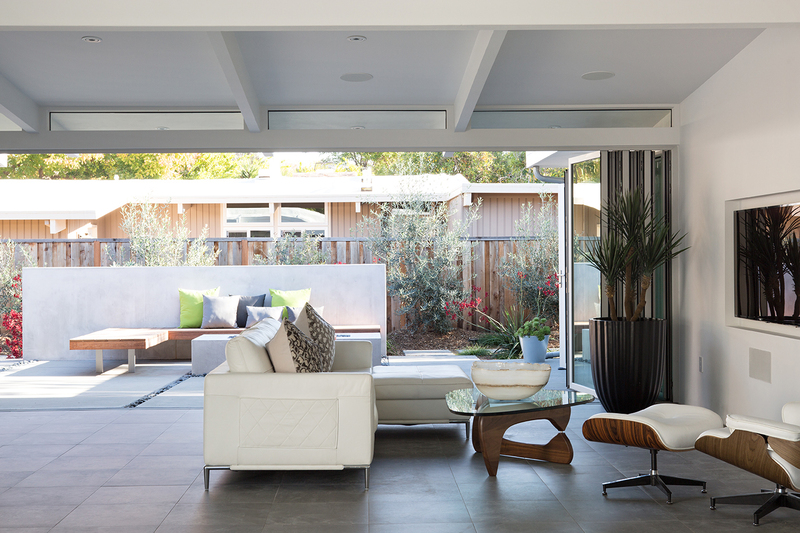 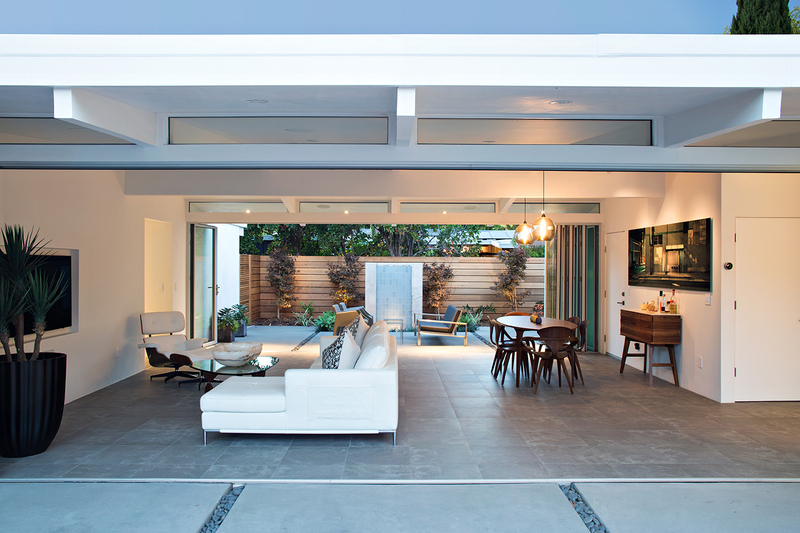 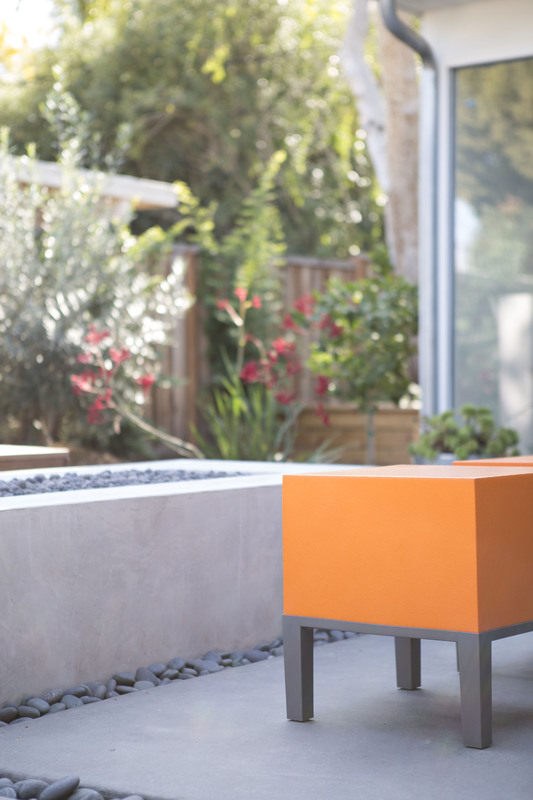 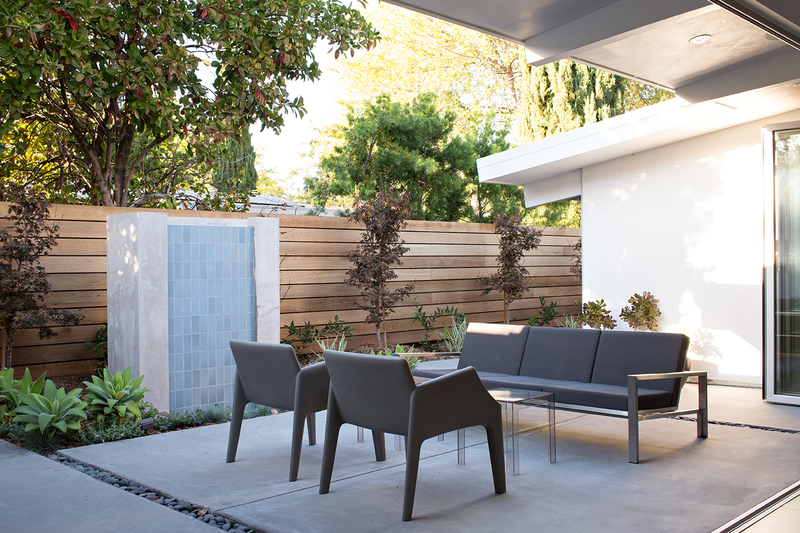 Klopf Architecture Construction updated a classic Eichler home to make it a truly open, indoor / outdoor home. 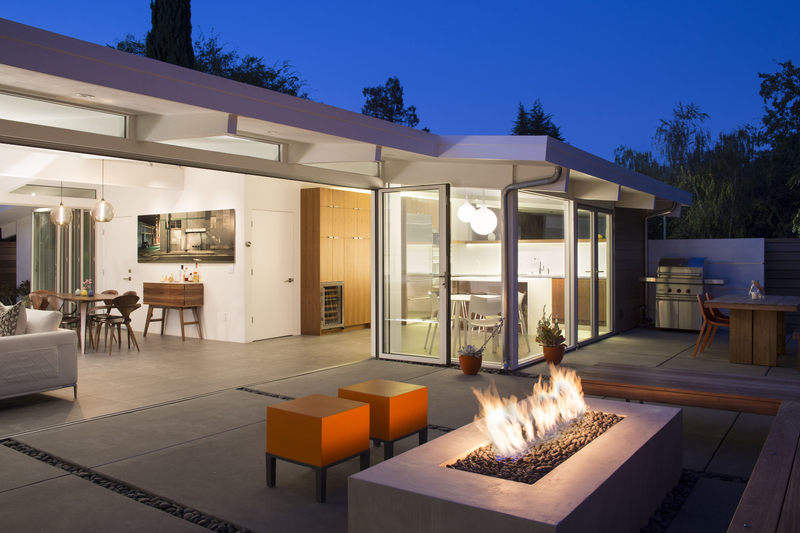 Expanding on the original walls of glass and connection to nature that is common in mid-century modern homes, Klopf moved the kitchen away from the entry, removed the heavy brick fireplace, and opened the house up completely to the outdoors to improve the flow and feeling of the home. 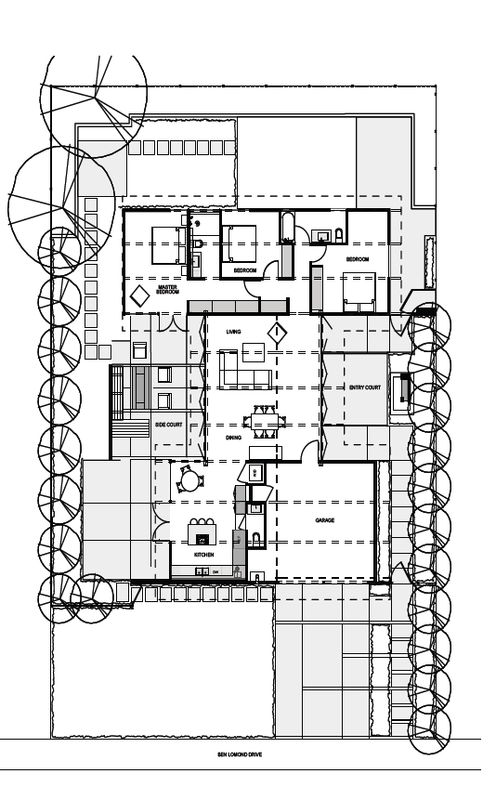 The concept of the house is clearer now than in the original state: two “wooden boxes,” one at the front and one at the back, contain the garage / kitchen / powder room and the bedroom wing respectively. 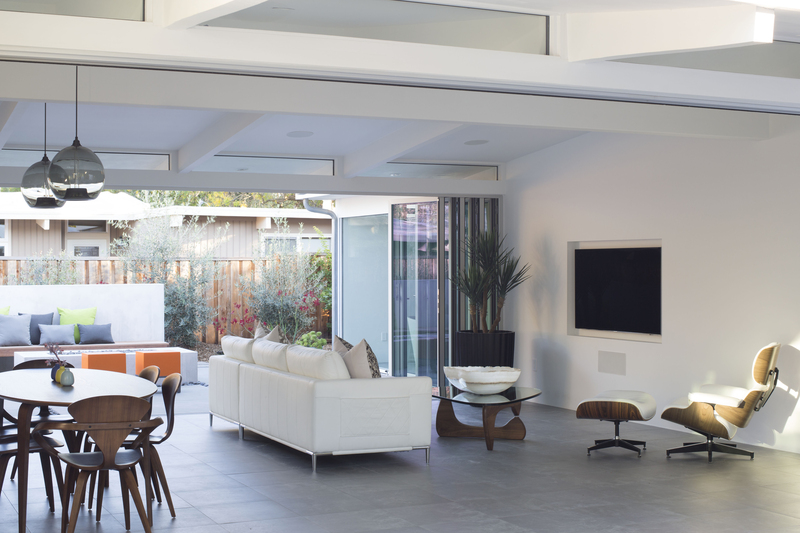 They’re connected by a conceptual “void” – the great room space – which is completely glass on both sides. 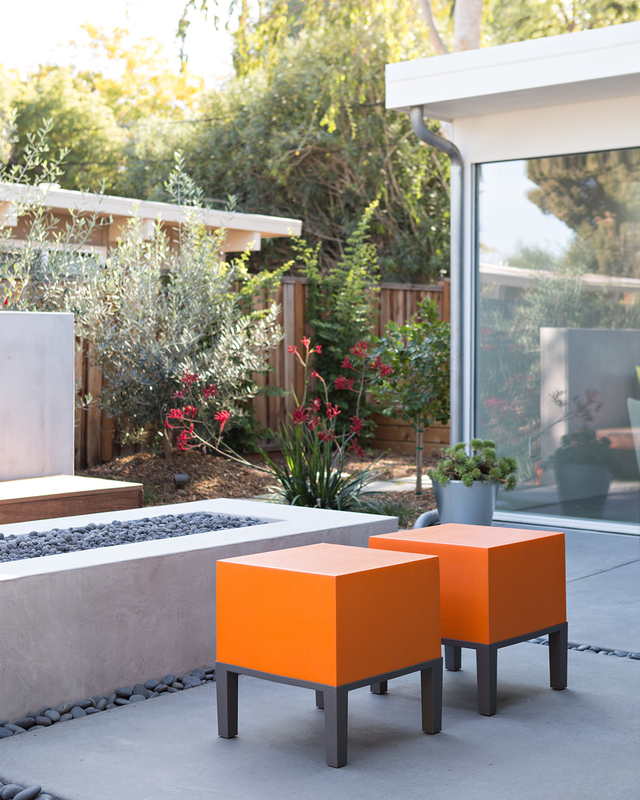 This space contains the living and dining areas, and when the two large glass walls are opened up, expands outward to contain one seating area by the fountain, another seating area by the firepit, and an outdoor eating area as well. 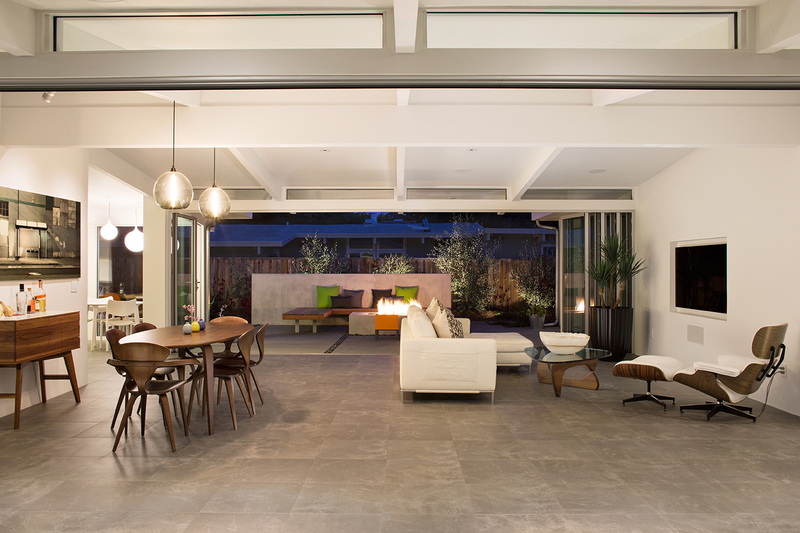 The completely openable walls allow the homeowners to truly open up the living space of the house, transforming it into an open air pavilion, extending the living area outdoors to the private side yards, and taking maximum advantage of indoor-outdoor living opportunities. 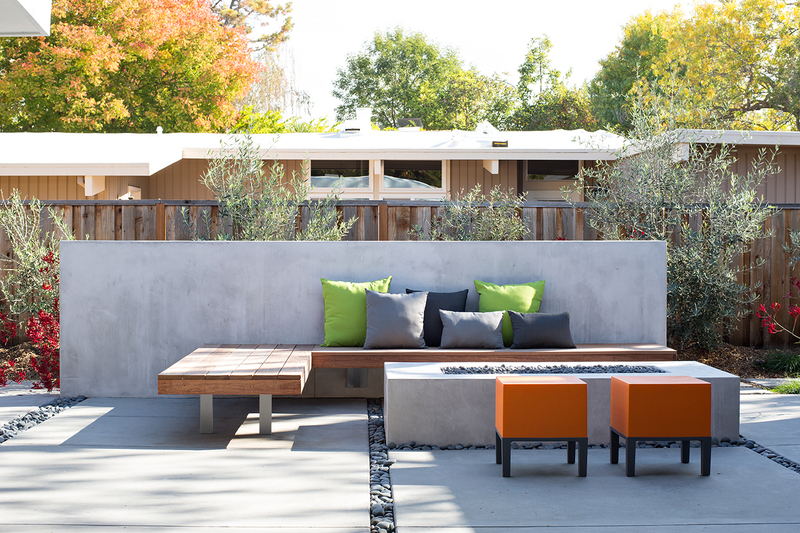 Taking the concept of borrowed landscape from traditional Japanese architecture, the fountain, concrete bench wall, and natural landscaping bound the indoor / outdoor space. 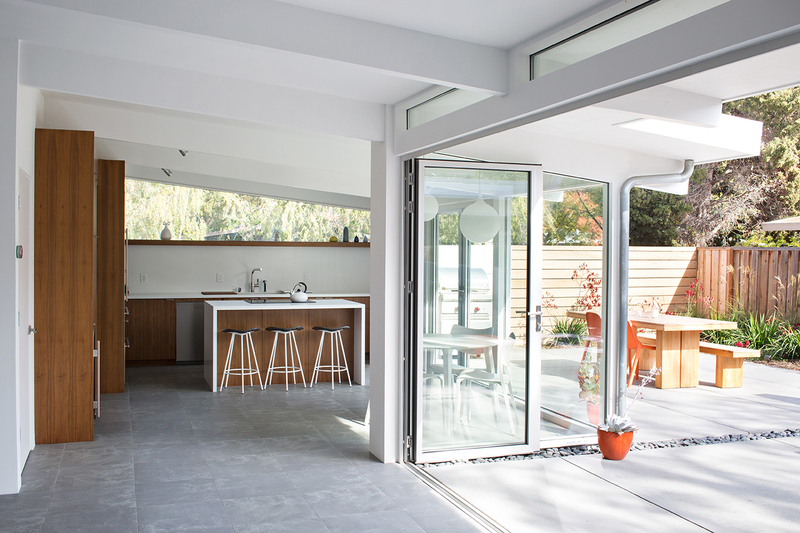 The roof extends past the folding glass door walls to help blend the interior and exterior spaces, not to mention provide shade and additional protection from the rain. 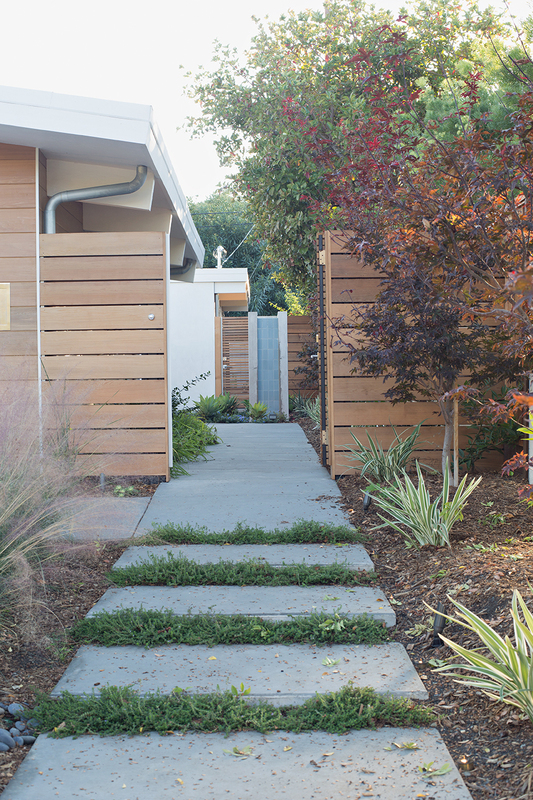 Cedar siding covers the two wooden boxes of the house, except for the white walls that continue along from exterior to interior to exterior at the great room. 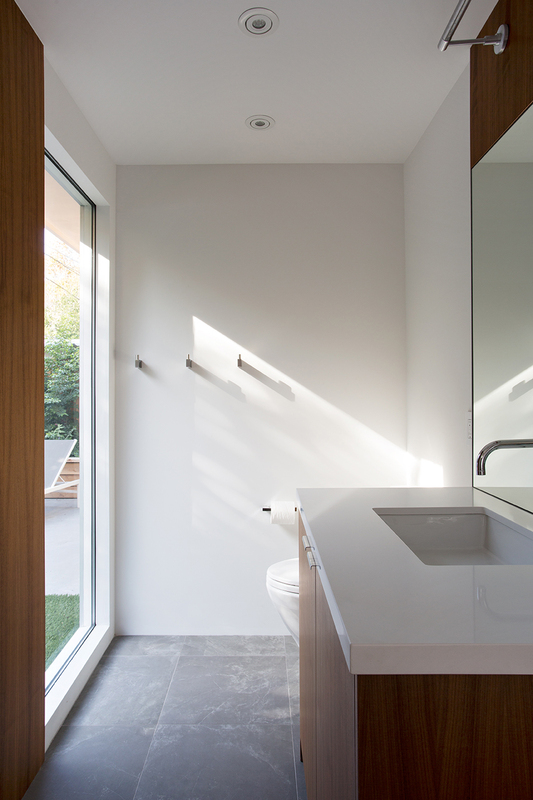 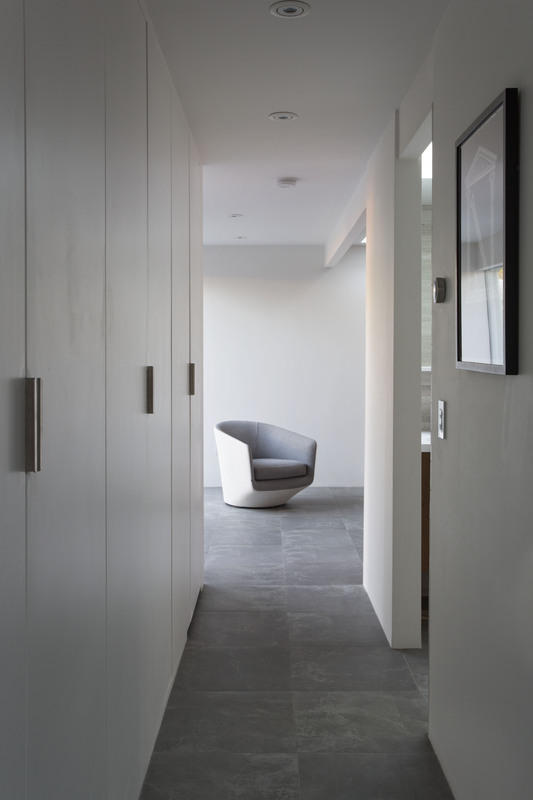 The smooth white surface extending from outdoors to indoors to outdoors again further blends the interior and exterior spaces, as well as providing a conceptual cut through the house, reinforcing the void that separates the two wooden boxes. 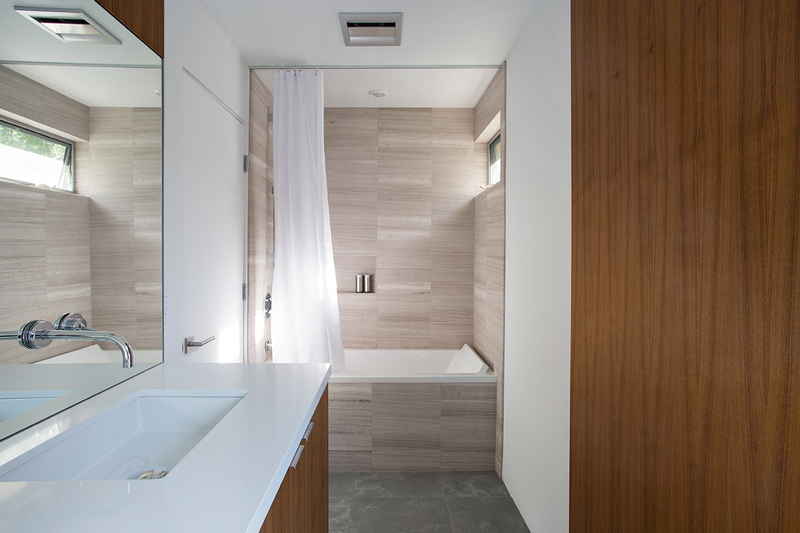 The bedrooms, bathrooms, and storage areas of the house are located in the private, rear wooden box. 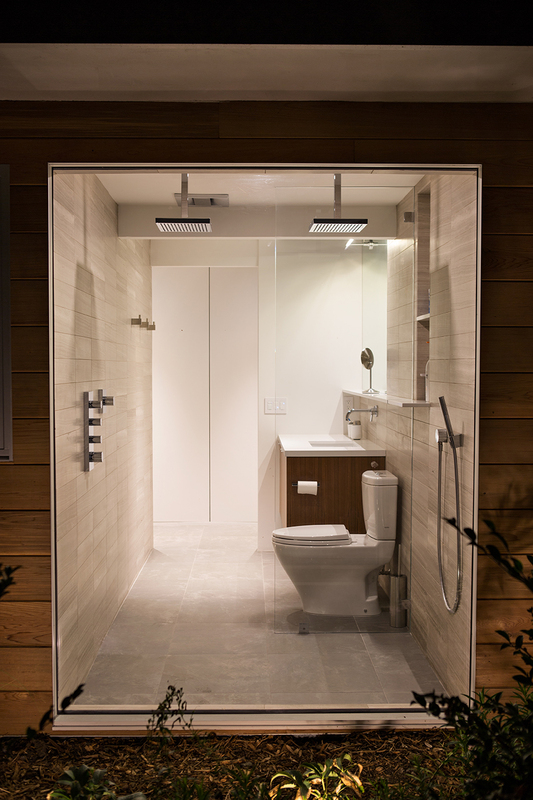 Rooms are open to the outdoors, even including bathrooms. 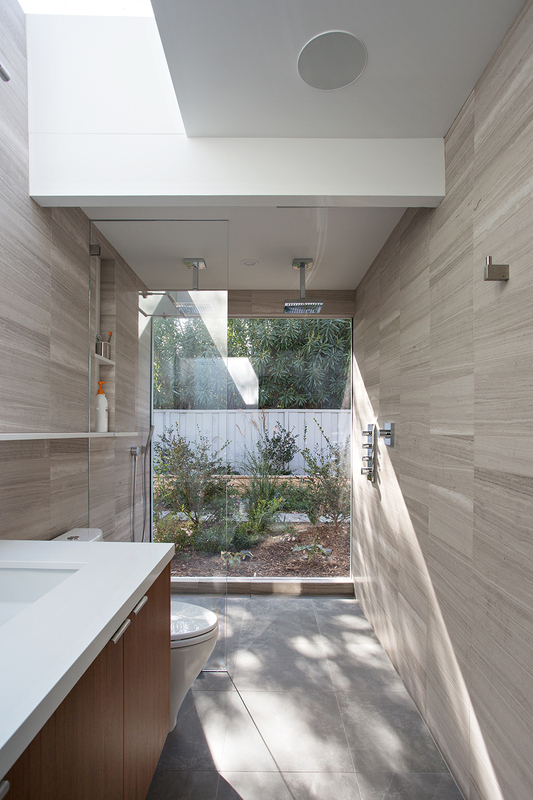 The master bath becomes a tunnel to the outdoors with a complete glass wall at the shower. 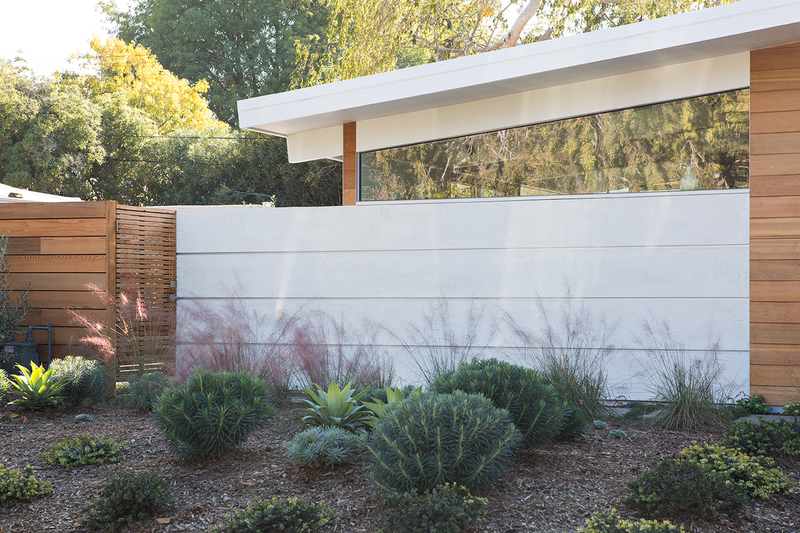 The clear glass wall looks onto the private, landscaped rear yard, and lets the homeowners feel like they are showering outdoors.